Veteran journalist Charles Glass will present “The Outlook for Religious Pluralism in Syria” on Oct. 21 at 7 p.m. in the Heights Room of Corcoran Commons. The Syrian civil war has claimed in excess of 200,000 lives, with an estimated 8 million Syrians, more than a third of the country’s population, forced to flee their homes. According to Glass, the nuances of this conflict have never been well-understood in the West, least of all, it seems, by governments in the US and Europe, who, anticipating Assad’s sudden departure, made it a condition of any negotiated settlement. The consequences of that miscalculation, he contends, have contributed greatly to the unfolding disaster and diminishes the possibility that Syria can return to being the religious pluralistic society it was ante bellum. Glass began his career at the ABC News Beirut bureau. He covered the October Arab-Israeli War on the Egyptian and Syrian fronts. He also covered the civil war in Lebanon, where artillery fire wounded him in 1976. He was ABC News Chief Middle East correspondent from 1983 to 1993. 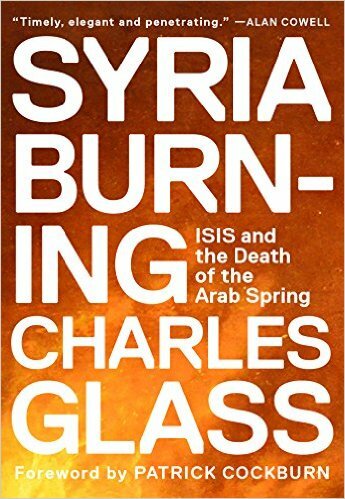 He is the author of the new book, Syria Burning: ISIS and the Death of the Arab Spring (OR Books). Sponsors: Boisi Center for Religion and American Public Life, Department of Slavic and Eastern Languages and Christian Solidarity International (CSI). This entry was posted in Guest Authors and tagged Boisi Center for Religion and American Public Life, Middle East, politics, religion, Syria. Bookmark the permalink.